New improved we dim the blue led indicator light so it is not too bright at night. Speaker selector switches allow you to connect multiple pairs of speakers to your stereo receiver or amplifier. The ATM 7-Zone Speaker Selector with Remote Control can control up to seven pairs of speakers so you can listen to music in multiple rooms simultaneously. 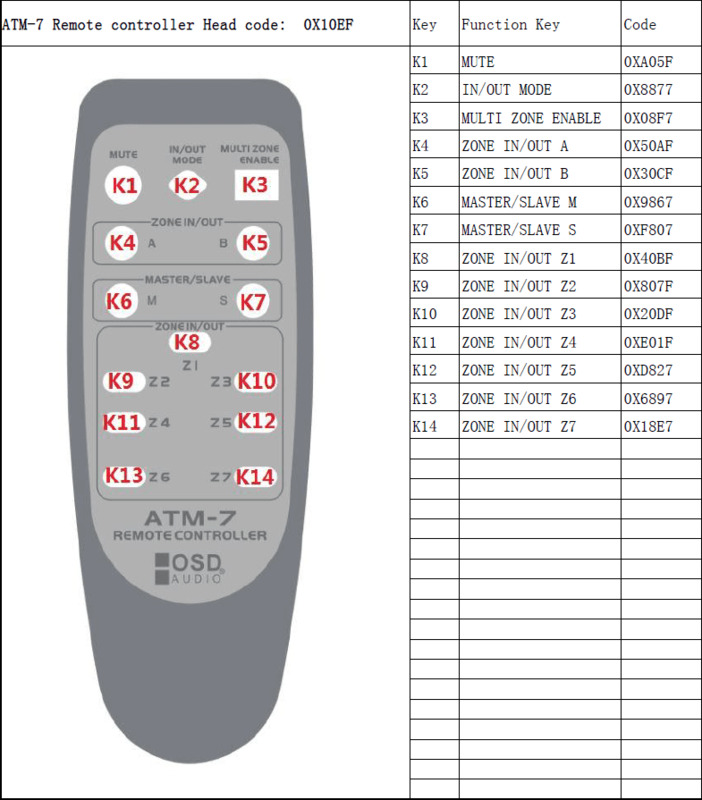 ATM 7-Zone Speaker Selector includes an IR remote control. With a backup memory function and a 10-meter remote operating distance, this may be the perfect solution for your needs. 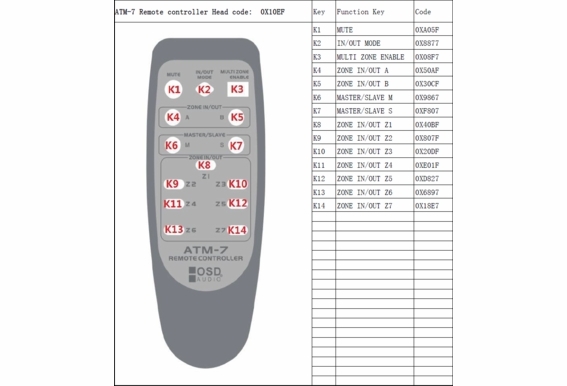 Also you can easily program the remote control to any of your favorite universal remote control with the factory code we provide. With self-adhesive tape for quick and easy fixing on any hard, clean & dry surface. While the speaker selector concept has been around for decades, they generally require you to either walk to the selector in each zone to turn the speakers on or off. 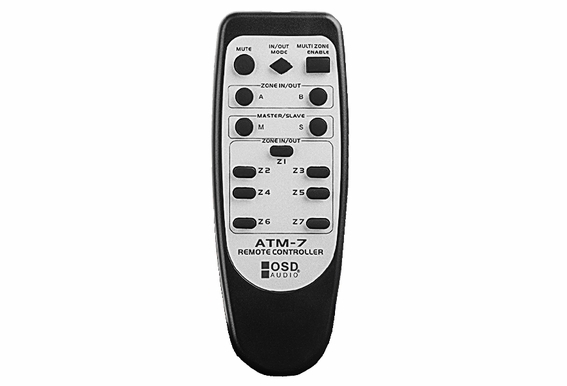 The IR remote(line of site to the speaker selector is required) control lets you select your speakers with ease. My inquiry is very simple but I need assurances I can accomplish what I think i can. I want to run 2 sets of speakers (not at the same time) the first set are simple KEF LS50's with a single pair of binding posts. The second pair of speakers KEF Q750's with 2 pair of binding posts. My amp is the Audiolab 8300A which has 2 pair output binding terminals per channel ( 8 in total ) Can I bi-wire my second set of speakers through this device? Hi, We have a nine-zone system set up in our home, each zone having one pair of in-ceiling speakers. Each room has a volume control knob for its pair of speakers. The speakers are rated to 40W (RMS) 60W(Max), and 8 ohms. Currently, we have a Denon DRA 685 amplifier and two Russound SS-6 selectors. When we run two or more pairs of the speakers (one speaker set upstairs and one on the main level) at the same time, the amplifier switches to a protection mode, which I assume is an overload protection mechanism. We would like to switch to a speaker selector with remote control, just for the added convenience, but thought we should also look into upgrading the amplifier to run multiple pairs of speakers at the same time without having the amplifier switch off. We welcome suggestions for an amplifier and speaker selector. Regarding the amplifier, we would like an amplifier that has Bluetooth and Wi-Fi compatibility, again, just for the added convenience. Hi- Does the remote work through walls? Hi I am running 2 Monoblocks and would like the ability to switch between 2 sets of speakers . One set are my main SVS floor standing speakers and one set are book shelf speakers with banana plug connectors. How can I do this? Hello, I want to have options for activating a pair (front L&R, rear L&R) of ATMOS in-ceiling speakers depending upon where I am sitting in my 3 row theater seating. The source is the ANTHEM 1120 receiver (see first image) that outputs front L&R and rear L&R 'height speakers'. Those would be switched as depicted in the second image.. Important must-haves: 1) No degradation at all of the sound from the ANTHEM to the speakers. 2) IR remote control, programmed into my URC universal remote, so that I can select the active pair of height speakers from my theater seats. Will the ATM7 do the job? Please don't hesitate to ask questions. Thank you. Howdy, the unit does not have volume control, does that mean whatever the volume comes from the receive that is what gets passed through? Or this unit somehow "generates" (for a lack of a better term) its own level? Thanks! Does this unit color the sound at all? I need something transparent as I'm looking for something that I can use in a recording studio to switch between unpowered monitors. I don't want the speaker selector to change the sound of the amp/speaker combination in any way whatsoever. All are powered by a Yamaha P2075 amp. I don't plan on running more than one set of monitors at a time so impedance protection isn't an issue. Is there a way on the remote to make sure that I don't accidentally activate more than one set at a time? Thanks much! i see that there is not a ON/OFF for the remote. Wonder if there is a IR code out there for it from the manufacture. I was thinking that if your AMP has a switched outlet that your could control it that way?? Anyone use it with a URC remote? I recently purchased an OSD ATM-7 to replace my Russound PRO-VC 6.1 as I want the convenience of remote operation for my whole-home speaker set-up. I just realized that the ATM-7 does not have impedance matching, and as we do not have volume controls installed for our speakers, I wanted to make sure that I don't overload my system with the ATM-7 instead of the aRussound. My speaker installation includes 5 pairs of in-ceiling Tannoy CMS50 ICT or CMS50T ICT (not sure which one). The power handling is rated at 50W and the nominal impedance is 6 ohms (nominal) / 4 ohms (minimum). My amp is an ONKYO TX-NR545 and doesn't seem to have any issues powering my 5 pairs of speakers in Zone 2 with the Russound (we've had this set up for serveral years). Here are the specs from the manual: Rated Output Power (North American) With 8 ohm loads, both channels driven, from 20-20,000 Hz; rated 65 watts per channel minimum RMS power, with no more than 0.7% total harmonic distortion from 250 milliwatts to rated output. Surround Mode Output Power (*) (6 ohms, 1 kHz THD 0.9%) 115 W per channel *Reference output for each speakers. Speaker impedance: 6-16 ohms Full specs here: https://www.intl.onkyo.com/downloads/manuals/pdf/tx-nr545_bas_adv_manual_en.pdf#page22 Any help you could provide would be greatly appreciated. I was really hoping to make this work and don't want to return the unit. Thanks! Could this unit be wired in reverse? Assuming it is passive, right? Could one hook up 7 amps or receivers to the speaker inputs and one pair of speakers to the amp inputs? volume controls can just be wide open since only one amp or receiver is being utilized at a time. This would allow a person with 7 different amps to compare and enjoy through his favorite pair of speakers if I'm not mistaken. I have one (another brand hooked up this way and it's awesome except for the cheesy spring connector terminals. The ATM7 has the banana plug connectors I need. I recently purchased the ATM7 and connected it to my receiver and speakers; however, I am not able to change the volume in any of the speakers. does thie atm7 conects directly in the bose receiver in the auxiliary audio input jacket? so we moved into a house that has speakers in all rooms. However there are no wall volume controls. I have a Pioneer SC-55 receiver that has 3 zones. Zone 1 = Living room is hooked up, via 5.1 sound. Zone 2 = master bedroom with 2 speakers, and Zone 3 is the patio with 2 speakers. Would I be able to use the ATM7 to split zone 3 to the master bedroom and 5 additional rooms in our house? Since I dont have any impedance matching volume controls can this ATM7 be used safely if I only turn on 1 room at a time off of zone 3? If so how is switching rooms for this unit done? would I first have to turn off one room then turn on the next room? Or can this be setup in a way that when I turn on another room that it automatically turns off the first room, more of like a toggle instead of splitting? Or would it be too easy to forget to turn off one room before turning on another & possibly overload my receiver? Is there a device I can purchase to put in front of (between receiver & ATM7) or after the ATM7 (between ATM7 and each speaker set) so that it will automatically impedance match and not overload the unit if I were to accidentally turn on two rooms at once? so that way I don't have to cut holes in the walls and splice into the wires to install volume knobs? What do you recommend? 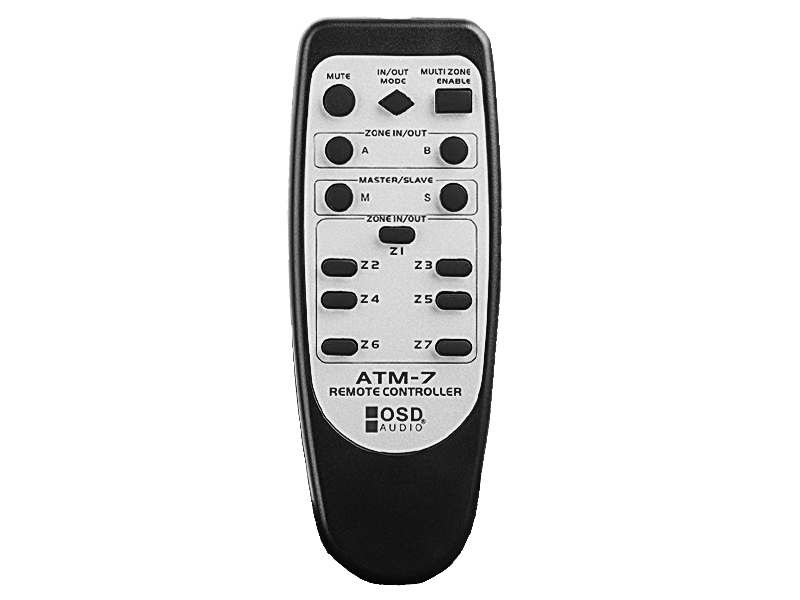 Am i able to independently control each volume with the remote control? I just purchased the ATM7 unit to run 4 zones fed off zone 2 of my Onkyo RZ710. Each zone is a separate room with one pair of speakers on each zone. There is a SVC-100 volume control in each room. Do I set the impedance matching selector to 1 for one pair in each zone or 4 for four pairs total? Does the power draw from the source amp change depending on how many zones are either on or off? Do you make an impedance matching remotely controlled speaker selector? I too want to use this with my Sonos Connect:AMP. I only want to switch one pair of speakers at a time. Connect:AMP ----> ATM7 From ATM7, I'd select Office, or Master Bedroom. Would I still need impedance matching volume controls? Does anyone know where one can find rack ears for the ATM7? I've looked around quite extensively finding nothing for the 1.5U size. I'm looking for an A/B speaker selector with remote capabilities (IR preferred), that can take the A/B source to four or more outputs, and A/B source can be selected at the same time on different outputs simultaneously(with volume control preferred, but not necessary). So I can play source A on output one and source B on outputs two, three and four, or other combinations, but A/B can be selected to multiple output simultaneously. Is there something like that? Can I use this to switch which speakers are active for a sons connect:amp? I'd like to have one connect:amp play in different rooms, but not at the same time. Thanks! Hello Greg, That is the function of this unit, but it doesn't have any impedance protection, so unless your Sonos amp can run less than an 8ohm load (4ohm - 2ohm) then you would need to run impedance matching volume controls for each set of speakers. Hi Garrett, You can, but we don't recommend it. This is intended for use with a high-current amplifier such as our AMP300. This unit doesn't have any kind of impedance protection, so it would be very risky running it off your 8ohm receiver. 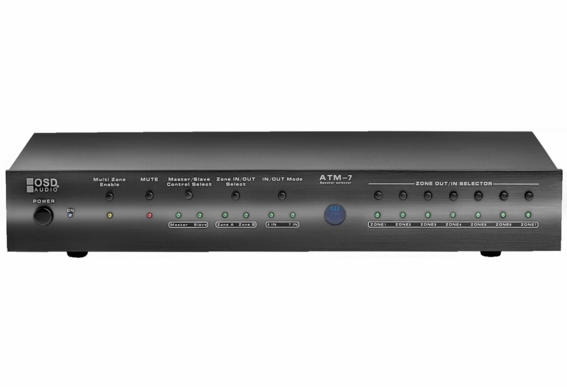 You could run your receiver into our AMP300 and run the ATM-7 off our AMP300 to power your outdoor system. I currently have two AMP120s connected to Zone 2 on my receiver, running four sets of speakers total. I need to be able to play 2x sets simultaneously maximum. I want to be able to control what zones are on via IR so am looking at the ATM7. I see I can connect both of the AMP 120s to the ATM7 but it looks like only one can be active at time. Is there any way with two amps that I can get two zones of speakers active simultaneously using the ATM7? If not, any other ideas? Thanks and love your products! Hi James, It's not recommended as receivers such as yours can typically only run at 8ohms (1 pair of speakers). Running a multi-zone speaker selector will create an unstable load and you run the risk of damaging your receiver. Best to run an AMP300 to the ATM-7. Hello, I bought 2 pairs OSD-ACE 540, 1 pair of OSD-ICE640, 1 pair of RC65i In-wall Loudspeaker from Polk Audio and 2 pairs of rc85i and 5 OSD-SVC205 (all installed and operating). I have a STR-DN1030 SONY and now I would like to use an ATM-7 (purchased), how do I connect the ATM-7 on the Receiver? Even having bought and installed the OSD-SVC205, can i install ATM-7? I need to buy a AMP300? Thanks! Hello, It would be very risky trying to run that many speakers off a standard receiver. I recommend going with our AMP300 so you don't risk damaging your components. Run a 4-conductor speakers wire from the amp to the ATM-7. 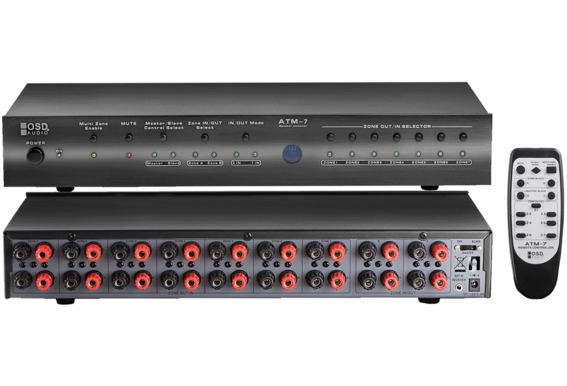 I just purchased the ATM-7 and AMP300 to use for my home audio system with 7 pairs of wall/ ceiling speakers. All the speakers are wired to a common location, where i will place the amp and speaker selector. Do i need impedance matching volume controls for the speakers? Currently i do not have them. my source is a sonos connect, so i can control the volume thru my ipad. is this going to work okay? Hi Bernard, Yes - the ATM-7 doesn't have built-in impedance protection like our other speaker selectors, so you would need to run impedance matching volume controls on each zone to run it safely. Is it possible to control the speaker selector with a iPhone, iPad ect? Hi Joe, The speaker selector require and amp to feed it power. You can run any handheld device such as an iPhone or iPad to the amp, but not directly to the speaker selector, as it is a passive device. The power supply for the speaker selector is only there to power the LED lights. Any speakers will need to be driven by an amp running to the selector. Ok, I am interested in this selector as it has remote control. It will drive 5 pairs of speakers. My source is the Zone2 out from a surround amp. What AMP would you suggest? The AMP200 or AMP300? I am not looking for wild power. I just want something that can handle the impendance load that could happen if all speakers are turned on. Thank you. Hi CR, Either the AMP200 or AMP300 will work, but you will have limited volume on the 200, as running 4-5 zones is going to be utilizing all of its power. The AMP300 has some extra juice for you to really get a lot of power with 5 pairs. Does the speaker binding posts accept spade connectors? I have very expensive speaker cables with only spade terminations. It is built to accept banana plug or bare wire. You may be able to get spade connections to work somehow, but we do not offer any solutions for spade connectors unfortunately. I have a Yamaha RX-V677 AV receiver which has the ability to power 2 zones. Can this unit be plugged into the second zone of the receiver to increase the number of zones in my system to 8? Also, I don't understand what volume impedance control is. Is that a problem in the way I am thinking about doing this? No, you would need a high-current amplifier to run something like the ATM-7. A home theater receiver is only intended to run a pair of speakers off the zone 2. 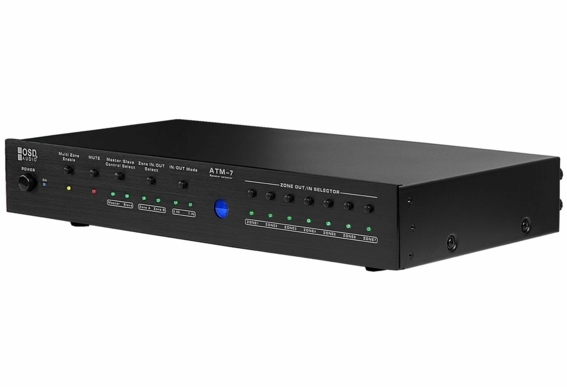 The ATM-7 doesn't have impedance protection which is pretty crucial when running that many speakers/zones, so we highly recommend running our impedance matching volume controls off each zone. My unit keeps turning off the speaker zone that I've selected after about a minute of play. Why would that be? I am interested in your AMP-7 speaker selector. Currently have 5 pairs of speakers wired around my house. I currently use the 2 in the living room ceiling and a pair of outdoor sparkers the most. I currently have a Sony Muti Channel AV receiver (STR-DH540). Can I make this amp work to run 3 pairs of speakers with you selector? Could this unit be used to compare amplifiers, i.e., to hook up a single set of speakers to several amplifiers? The illustrations for the hookup don't show any impedance matching volume controls. Why are they needed? More of a comment than a question.... seems strange there would be a full-function remote with no power button. I would think that would be the #1 use of a remote - to turn a device off and on. Can anyone tell me what the THD (Total Harmonic Distortion) ratio is for this product? I am wondering if this unit allows the A/B channels to be used simultaneously. If so, I can use the unit to drive the fronts/rears of two different rooms with 5.1 systems. I would simply need to add a 1:2 splitter for the center channel and the amp I am using will drive two separate sub woofers. How high is this unit rated, and how does it compare with Niles Audio? I'm very interested in this product although the 15W power consumption is too much for me. I was wondering if the on/off button is a hard or a soft button. If it's a hard button I would connect it to my home automation system so I can switch off the power with the home automation when the unit is not being used. If it's a soft button that's by default off when the power comes on I would be unable to do that. Hi. Will the ATM-7, or any other typical speaker selector work with outside wireless pool speakers?